In a very unusual spell of fine weather lasting precisely one day and in between a few chores like buying expensive Euros and fetching our caravan to make ready for our coming trip to France, I enjoyed a couple of hours back at good ol’ Sandhouse Lane Nature Reserve. I wanted to try a slightly larger close focus ring, 31mm, to get a tad closer if possible. I’m clearly making the most of this while the wildlife season lasts. I enjoy this site so much not only because of the wildlife there but because I’m often the only visitor. This time, though, I actually did see another person walking three dogs. Most of our invasion of Painted Lady butterflies seemed largely to have disappeared. I did see two hangers on but most of the now reduced Lepidoptera activity was down to Gatekeepers and very skittish Common Blues that just didn’t want to cooperate with the camera. I soon got frustrated by their lack of cooperation and went off to investigate the dragonfly and damselfly pools. They, too, seemed a little quieter at first but then I spotted a mating pair of Common [Ed: correction, 2010-02-08] Ruddy Darters in their Copulation Wheel formation. They wouldn’t let me approach too close, perhaps not unnaturally, but I did manage to grab a worthwhile shot which I’ve cropped just a little (right). I moved on to where I’d previously seen a male Common [Ed: correction, 2010-02-08] Ruddy Darter hunting. Darters are so called because they tend to sit motionless on a perch watching for flies, then dart out to catch them, subsequently returning to their perch. Spotted Flycatchers (the birds) exhibit very similar behaviour which is called sallying. Knowing the perch gives you a fighting chance of snapping them ‘cos you can line up on the perch and wait for your subject. Sure enough, my cooperative little subject was, indeed, hunting on his usual patch. This time I did get close enough to benefit from my larger close focus ring. This shot (left) is full frame, not cropped. I moved on to the main pool and spent quite a time just watching but seeing little that was new or appealing photographically. I did waste a lot of time trying without success to track a Hawker of some kind in flight but that really was wishful thinking and was never likely to happen. 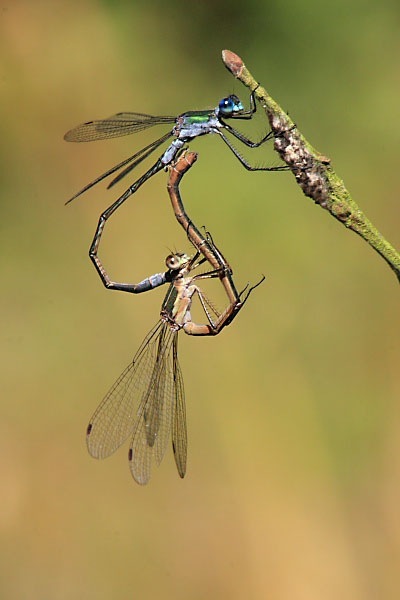 I was about to move on when a mating pair of damselflies landed on a branch right beside me and formed their Copulation Wheel. Yikes! The position and light were great, the background was great, I just had to bang off about 60 frames trying repeatedly to get my focus accurate. Even an aperture of f16 with the close focus ring gives a depth of field that’s very thin and swaying slightly loses focus, hence my multiple attempts. I’d taken a monopod but left it in the car boot thinking I’d never be able to use it swiftly enough. Wrong, you foolish person! In this situation it would have been perfect. Anyway, I’ve discarded the fuzzy shots (about 50 of them) and here, again uncropped, is a good one (right). I’m not completely certain about this species but I suspect that it is Nehalennia speciosa, the Pygmy or Dwarf Damselfly [Ed: correction, 2010-02-08] a pair of Emerald Damselflies. for our Winter issue and would like to add a brief mention and link to your splendid blog. I think your butterfly/dragonfly observations would be of interset to many of the ‘Vole’s’. 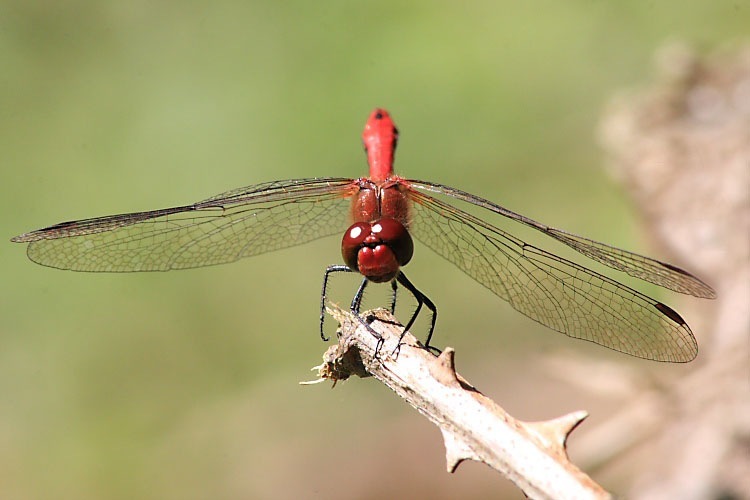 Yes, Rory, you’re quite right about the Ruddy Darters rather than Common Darters. I realized my mistake when I discovered iSpot sometime after this post. It’s good to have your confirmation of some of the other chaps, though. Thanks for your help.